Too hard. But Shikamaru in the end after flipping coin. the strong are the ones that should stand at the top. Even in a popularity contest. The weak are meat and the strong eat. Survival of the fittest. Only the strong survives. I disagree with that i mean Shikamaru is one of the best examples of that he's nowhere near the strongest character in Naruto yet he's one of the most if not the most popular character. I still voted for Hisoka though but it was actually a hard choice for me. Popular characters don't just come with how strong they are everyone loves the lazy tactician i think its just mainly the idea of pretty much everyone he fights being stronger than him yet he still in most cases beats them by outsmarting them. You basically only named strong characters from Naruto which isn't what people always vote for. i would agree wit that if shikamaru had used his intellect to beat someone important or actually strong. He beat Hiden, arguably the weakest member of the akatsuki by far. And he beat him in a way that wasnt even all that clever. He blew him up. That method would literally work on anyone else. Nuking someone with a lot of explosions cause u cant figure out another way to beat him is not the same thing as outsmarting them. Yea the way he beat temari and that flute girl were decent strategies i guess but that would only matter if they were even slightly important characters. 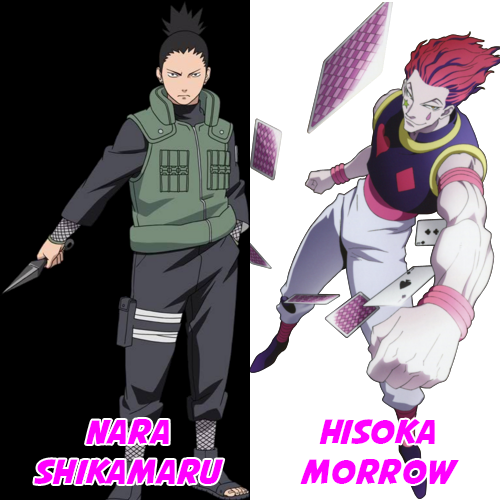 If shikamaru had a moment where he crossed paths with madara and managed to outsmart him, even if he didnt beat him but manged to escape or stall madara in a major way then i would give it to him. But no shikamaru beat 2 side characters and 1 beyond weak villian.